One of the world's largest milling machines has been inaugurated at the Walter Tosto facility in Ortona, Italy. Called the PowerTec, it was specially designed and built by German tooling manufacturer Waldrich Coburg to mill the large stainless steel sectors of the ITER vacuum vessel. 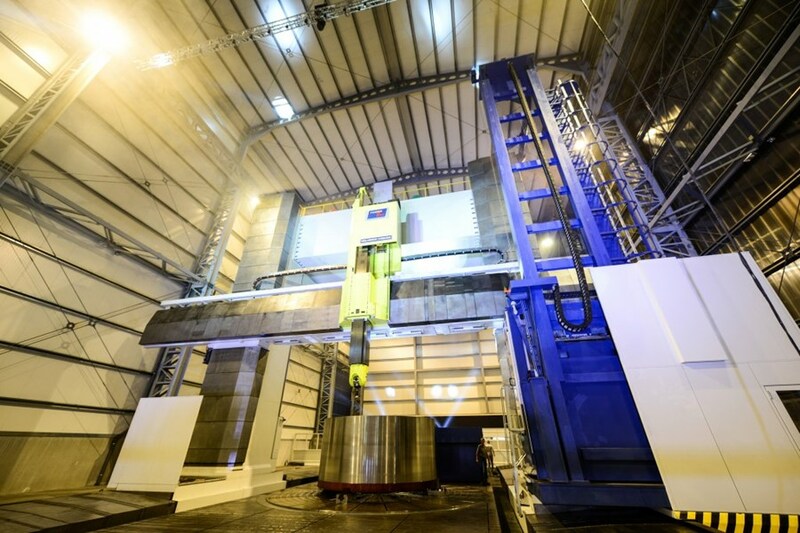 Weighing 1,300 tonnes, PowerTec is one of the largest high precision portal milling machines ever built. The giant measures 50 metres in length, and is 18 metres tall and 22 metres wide. With a travel length of 35 metres and a maximum clearance of 10 metres—both in height and width—the PowerTec could easily clear a small home. But when it comes to handling ITER's high-tech components it's not only the sheer size that counts, it's also the precision. The manufacturing of the ITER vacuum vessel requires extreme precision in order to be able to successfully integrate many in-vessel components such as the blanket, the divertor and the in-vessel coils; for most of these components tolerances are on the order of 1-3 millimetres. The dimensions of the milling machine inaugurated at the Water Tosto facility on 10 September were dictated by the dimensions of the vacuum vessel sectors themselves, each weighing about 450 tonnes and standing 12 metres tall. Of the nine ITER vacuum vessel sectors, seven will be built by Europe and two by Korea. In October 2010 the European Domestic Agency awarded its procurement contract to the European consortium AMW (Ansaldo Nucleare S.p.A, Mangiarotti S.p.A and Walter Tosto S.p.A).